Never before has the screen offered two screaming terrifying horror hits like American-International's Voodoo Woman and "The Undead". From the company that produced "Day the World Ended", "She-Creature" and "It conquered the World" now comes a show so chilling and strange that movie fans will find themselves watching three hours of top excitement and thrills. Lovely Maria English stars in Voodoo Woman as a girl who becomes a horrible monster through the machinations of Tom Conway, portraying a mad outlawed scientist who lives in the darkest voodoo jungle among a tribe of headhunters. Touch Connors, Lance Fuller and Mary Ellen Kaye co-star. "The Undead" is a supernatural witchcraft thriller in which a man fights the devil himself to save the girl he loves from the headman's ax e with Richard Garland, Allison Hayes and Pamela Duncan top-lined. from 10,000 Leagues" and "The She-Creature" and "It Conquered the World", now comes the most terrifying, weird and supernatural voodoo witchcraft show of them all, Voodoo Woman and "The Undead". 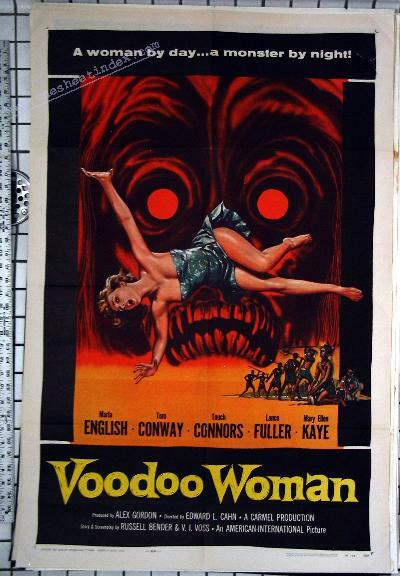 Lovely Maria English, the screen's pin-up glamour queen, stars in Voodoo Woman, in which suave Tom Conway transforms her into a monstrous creation which destroys villages and people. Touch Connors, Lance Fuller and Mary Ellen Kaye, three of the screen's fastest rising new faces, are co-starred in this tale of action, thrills, and strange voodoo adventures. "The Undead" is a strange tale of supernatural witchcraft in which a man tangles with the devil himself, top-lining Allison Hayes, Richard Garland and Pamela Duncan. Something new in horror pictures is in store for movie fans when American - International's supernatural witchcraft and voodoo combination, Voodoo Woman and "The Undead". Lovely pin-up queen Maria English essays the title role in Voodoo Woman as a ruthless adventuress who braves headhunters and strange voodoo rites to venture into the deepest jungle for a lost treasure. Tom Conway, demented outlawed scientist, turns her into a monstrous creature which goes on a rampage of murder and destruction in spite of the efforts of Touch Connors, Lance Fuller and Mary Ellen Kaye. A man's fight with the devil himself to save the girl he loves from the headman's axe is one of the unusual plot situations in "The Undead", witchcraft chiller top-lining Richard Garland, Allison Hayes and Pamela Duncan. Together, Voodoo Woman and "The Undead" provide three hours of spine-chilling thrills not equaled since the days of "Frankenstein" and "Dracula".